Kevin Durant was just about to walk onto the San Antonio Spurs’ game floor for a pregame workout when he stopped to bless himself by doing the sign of the cross and pointing to the heavens. By the sound of Warriors assistant coach Willie Green’s assessment after testing Durant physically Wednesday morning, perhaps the 2014 NBA MVP could be available sooner than expected. Keep in mind that Golden State beat NBA MVP candidate James Harden and the host Houston Rockets 113-106 a night earlier. The Warriors (61-14) are playing their best ball of the season without perhaps their best player in Durant. 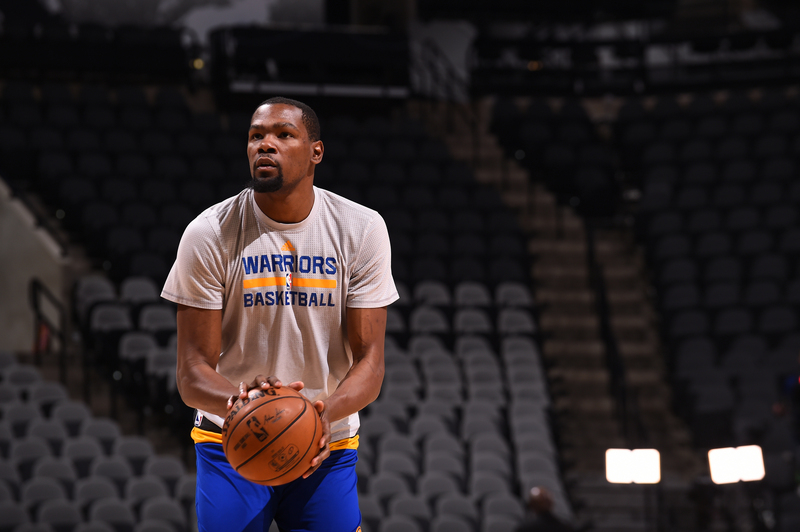 Kevin Durant #35 of the Golden State Warriors warms up before the game against the San Antonio Spurs on March 29, 2017 at AT&T Center in San Antonio, Texas. Golden State has missed Durant and his game averages of 25.3 points, 8.2 rebounds, 4.8 assists and 1.6 blocks for the past 15 games. The Warriors also stated Wednesday that Durant can begin noncontact shooting and jumping drills with the hope of raising the intensity level from a cutting and lateral standpoint in the coming days. The Warriors added that the 6-foot-9, 240-pounder would eventually return to practice and contact drills as he progressed. The Undefeated, however, learned that Durant actually returned to contact Wednesday morning when he played Green in one-on-one in half court six times before concluding with a one-on-one full-court contest. It was the first time Durant engaged in one-on-one competition since his injury. Green isn’t your typical assistant coach to work out against. The 12-year NBA shooting guard concluded his career with the Orlando Magic during the 2014-15 season. “I played a little bit in the NBA, so I’m a little accustomed to playing,” Green said of Durant’s workout. “He did crush me. He won every game, but it was competitive — at least, I’d like to think. It was more so about him getting used to playing again. Some of the moves he hasn’t done in a while. Green wasn’t easy on Durant, as he “pushed him a little bit to see where he is at.” Durant responded well on offense and defense and felt good afterward. The Warriors have said Durant will not talk about his injury while he is sidelined. “I was pushing and he was right there. He was cutting me off on defense, blocking shots. I don’t know if that is saying much. He looked good from my perspective. … He looked a little fatigued, which is expected right now, especially going up and down playing one-on-one full court,” Green said. Durant also returned for a second workout before the game that lasted about 30 minutes. Warriors assistant coach Bruce Fraser made Durant break a nice sweat by putting him through a series of solo shooting and dribbling drills. Durant showed explosiveness by taking the ball strong to the basket with a hard dribble and dunking with authority numerous times. The five-time All-NBA first-team selection moved fluidly, quickly and without a hitch. Perhaps the best sign of pending recovery is he displayed confidence in his left knee by shooting off his left leg several times during a midrange jumper drill. The silver lining to Durant’s injury is that the Warriors have grown as a team without Durant. Kerr said reserve Andre Iguodala has been “more aggressive” offensively off the bench and has played “incredibly well.” Kerr has gained confidence in reserve guard Ian Clark, who is “playing really well” offensively. A healthy West is adding some inside punch, strength and leadership off the bench. The Warriors’ nine-game winning streak came after the team lost three games. Kerr loves how the Warriors are playing as a team and said his only concern at the moment is fouling. Durant looked healthy and strong enough to play right now. Perhaps if it were the playoffs, the 28-year-old would be back already. ESPN.com’s Marc Stein reported Sunday that Durant could be back for the Warriors’ final three regular-season games. But if Durant is ready sooner rather than later, should the Warriors bring him back? “There is no need for him to play now,” Warriors forward Draymond Green told The Undefeated. “There is no need for him to rush back. Whether he could play or not now, honestly, I just don’t know. We want to make sure that thing [knee] is 100 percent healthy. Little Jake responded by just shaking his head in agreement, as his focus was staring in awe of Durant. The Warriors will likely be in awe of Durant again on the court soon, too. The big question is when?